Lance Armstrong should’ve followed his own fame advice – Live! Starring ... You! 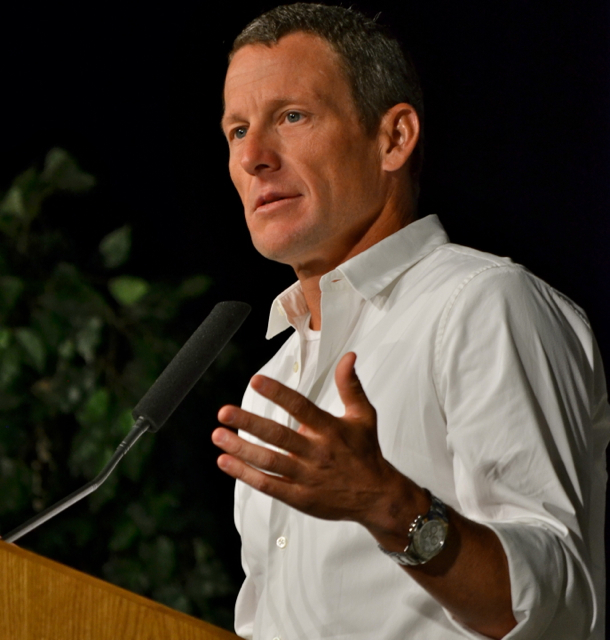 During his visit to the University at Buffalo in spring 2012, Lance Armstrong warned LSY! sports editor Hailey Rose Gattuso about fame. Last year, before his seven Tour de France wins became tarnished by strong evidence of doping, I had a chance to ask Lance Armstrong about fame. He proceeded to tell me how media attention can be great when recognizing your accomplishments, but it can really blow up your mistakes. Fame really isn’t serving Lance well right now as it is doing exactly what he warned me about. After a lengthy investigation revealed he took performance-enhancing drugs during his Tour de France streak, he was stripped of the titles. Last week, in an interview with Oprah Winfrey, Lance admitted to taking the drugs. The public backlash has been harsh. As I think back to his speech and my short conversation with him last year, which happened when he was speaking at the University at Buffalo, I was very inspired by Lance. I’m an athlete. All dedicated athletes struggle with different setbacks, but he overcame cancer. That made it seem like anything was possible. I was so inspired that I read his book and did a report on it for school. I would think about him and his success constantly during sports because it kept me motivated. By reading Lance’s book, I discovered a lot about him and his past that I never suspected, much less knew. He grew up without a father figure and treated his mother like a princess because she had always been so supportive of him. He worked very hard at improving in sports and sacrificed a lot of his social life. This was especially inspiring to me because I’ve had to sacrifice a lot of my social life for sports and sometimes it’s really difficult. I didn’t know too much about Lance before seeing him last spring, so I haven’t really grown up with him as a role model. I was a little disappointed when I found out he had admitted to doping because I had found his path to success so fascinating, but I’m really just focusing on all I can learn from him. He showed that when you have dedication to something, no matter how difficult your life is in other areas, you can become successful. That is a bad feeling. I know because, on a smaller scale, I’ve been there. During cross-country season this year, I started off with very slow finishing times in my races compared to what I had last year. I had people asking me why I wasn’t placing as well as the previous season, and my coach showed me the old times compared to the new ones. I couldn’t believe how slow I had gotten and had a mini panic attack. I realized I had work to do. I focused extremely hard for the next two weeks, and ended up setting a school record in a dual meet on my favorite course. When you work hard and make a comeback, that feeling is priceless. The lesson is that if you are ever faced with the question of, “What happened?” don’t panic and look for a quick fix, because it will come back to haunt you, just as it is for Lance right now. If you ever do make a mistake, admit to it right away, or you might end up trying to cover up past lies with more lies, making it more and more difficult to come clean. For many fans, Lance Armstrong’s career was – to borrow his words – just “one big lie.” He probably didn’t plan for it to be that way, but every time he tried to cover up his drug use he was setting himself up for more lying. I think Lance and I interpreted his fame advice – “be careful” – very differently. He seems to have thought hiding his mistakes was being careful. But seeing what he is going through right now makes me think that the definition of careful should be recognizing your mistakes, admitting them, and then fixing them.